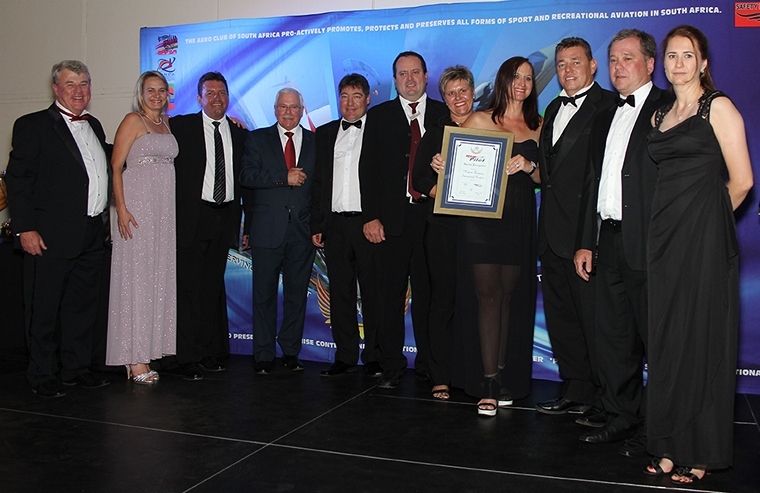 The Aero Club of South Africa Hosted their Annual awards dinner at Air Force Base Zwartkop on Saturday 7th of November. 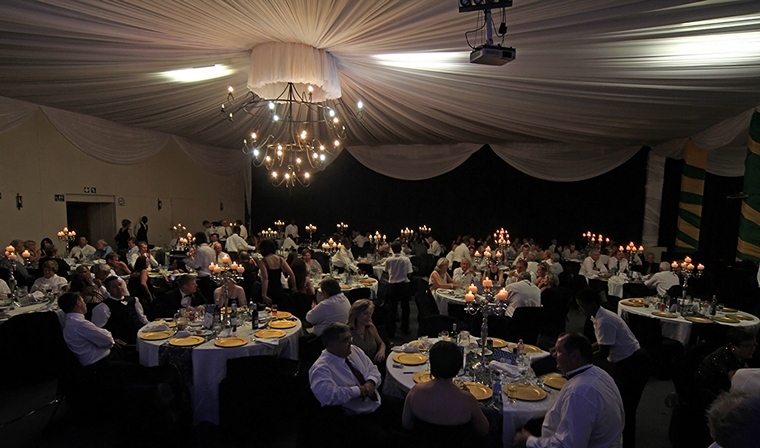 The event was, as has become customary; a formal “Black tie” event attended by all the major role players in the General Aviation sector in South Africa. 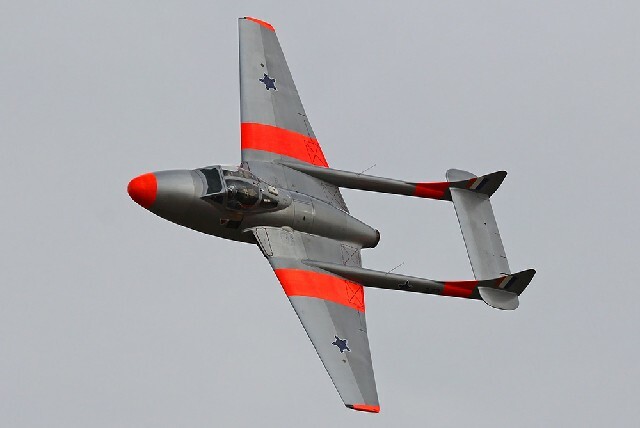 After a welcome sherry and a bit of casual banter the proceedings were kicked off by Col Rama Iyer flying an impeccable display in the South African Airforce Museum's beautifully restored T55 Vampire, this particular Vampire, No 277, is one of two reaming airworthy Vampires in South Africa the other is in private hands. Dr Mike Brown the master of Ceremonies for the evening invited everyone in to the stunningly decorated hangar, for the formal section of the evening. Col Jeff Earl officially opened the event and delivered a very inspiring Chairman's address, emphasising the current state of The Aero Club which is very promising both in Personnel and Finances. 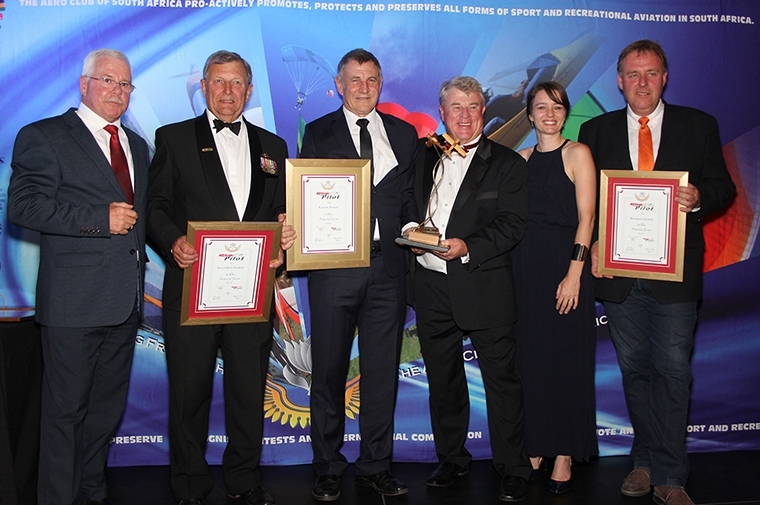 The Aero Club is living up to their moto of Pro-actively promoting, protecting and preserving all forms of sport and recreational aviation in South Africa. 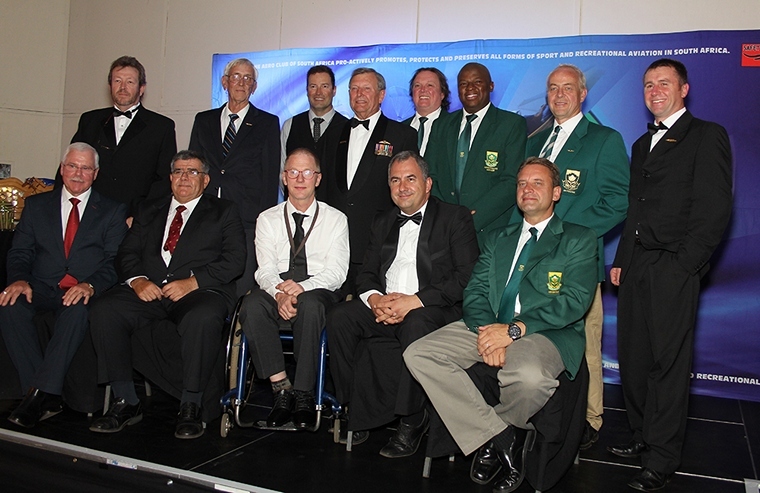 The awards ceremony was started with the awarding of SASCOC National Colours Certificates. The first recipients were the Members Class F3K Soaring Model Aircraft Team who recently competed in the 3rd FAI World Championships for Soaring Model Aircraft Class F3K, the members are: Ivor Fletcher, Craig Goodrum, Alan Smith, Christiaan Van Rooyen and Tshepo Molefi Illma Stockton the Junior Manager and Zane Mannell the Senior Manager. Bryan Currie, Johan Sieling, Arney Sieling and Manger Cilliers Van Niekerk for competing in the 16th FAI World Championships for Aerobatic Model Helicopters Class F3C. Craig Goodrum, Alan Smith, Michelle Goodrum and Manager Ivor Fletcher for competing in the 20th FAI World Championship for Soaring Model Aircraft Class F3B. Next up was a group of people that competed in the 1st FAI World Indoor Skydiving Championships held in Prague, Czech Republic from the 21 to 24 October 2015, as this a fairly unknown discipline Dr Brown asked Paul Marcellin to give a short explanation of the sport, on behalf of his teammates Claire King, Dirk Venter and Colin Rothman. Indoor Skydiving originated in a skydiving simulator which was used as a training tool for professional skydivers, basically the competitors do a serious of manoeuvres in a vertical “wind tunnel” and are judged on their execution. 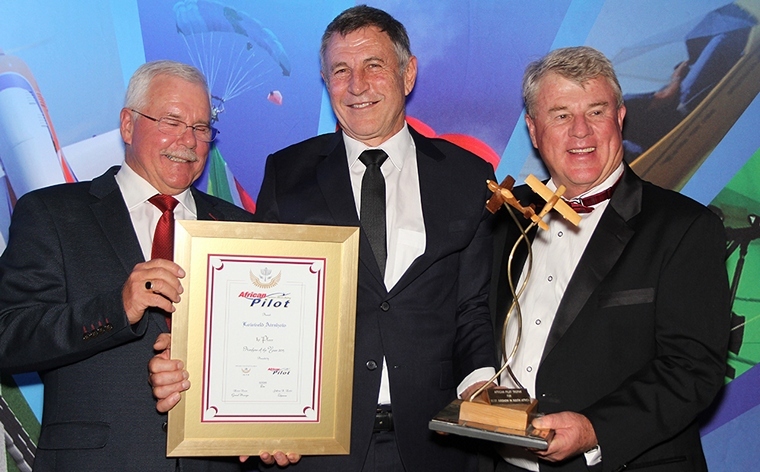 In another first Pierre du Plooy, Clifford Lotter, Glen Warden, Michel Leusch, Neville Ferreira, Leigh le Gonidec and Jacques du Plooy competed in the 1st FAI World Intermediate Aerobatic Championships this was held in Mossel Bay, South Africa 26 November - 03 December 2014, Stan Oliver was the Manager of the team. Pieter du Preez and Charles Urban for competing in the 4th FAI World YAK 52 Aerobatic Championship also held in Mossel Bay, South Africa. Last but by no means least A Rainsford-Alberts, R. Achterberg, C. Van Noord, K. Bowden, A. Naude and T. De Bruin for participation in the 14th FAI World Paragliding Championships held in Valle De Cauca, Colombia. Congratulations to all the recipients for keeping South Africa's flag flying high at all these international events. Russell operated as a Commercial Pilot flying Cessna Caravans and King Airs at Streamline Air Charter. After completing his ATP, he took an interest in operational and management in aviation, and assisted in the merger between Streamline Air Charter and NAC acting as the General Manager of Operations for NAC, before leaving to jointly start Awesome Flight Services where was MD and Director of Operations for almost 15 years. Russell represented ANSO (the Association of Non-Scheduled Operators) a significant constituency of the commercial aviation industry affiliated to CAASA and participated in many fora. The most notable, the SCORR process, where many regulations were re-written. As a CAASA representative he remains a force of sage wisdom and guidance to CARCom. 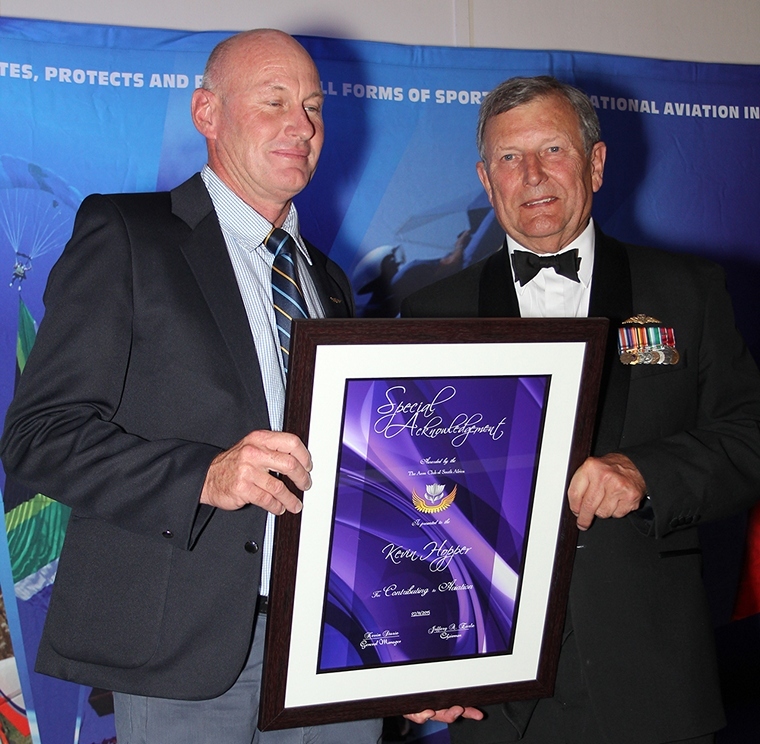 The Aero Club of South Africa recognises Russell's invaluable and tireless input with this award made on behalf of the entire Aviation Industry. Russell will be sincerely missed with the ongoing work at CARCom as he leaves the industry this year. Kevin is a respected AMO for TC and NTC aircraft. He readily shares his experience and knowledge with others and constantly undertakes projects for the sole purpose of furthering the efforts to keep experimental aviation alive in South Africa. He strives to make aviation affordable, safe and accessible. He always has time to give advice and to a look at aircraft and help diagnose problems. His speciality work includes Tiger Moths, Chipmunks and all fabric covered aircraft. His desire to expand his knowledge of aircraft specific details, engine and prop specifications, airframes and general technical knowledge, enable him to assist fellow aviators to build, refurbish and maintain their aircraft. Since 1997 he has been a valued guide in all technical matters for the EAA and supports related Aero Club Projects. He manages a build project for the EAA Chapter 322 almost every Saturday with a team of keen members, building aTeddy aircraft for the Association. 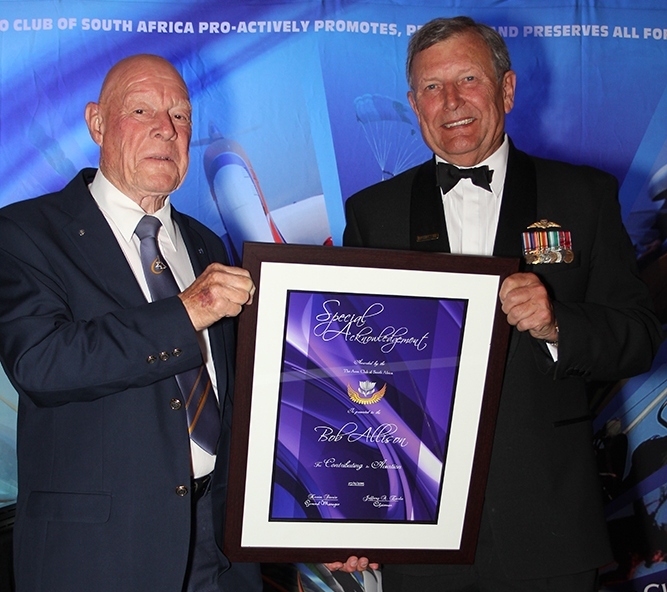 The Aero Club of SA recognises Scully's 35 years giving massively to the airshow circuit. 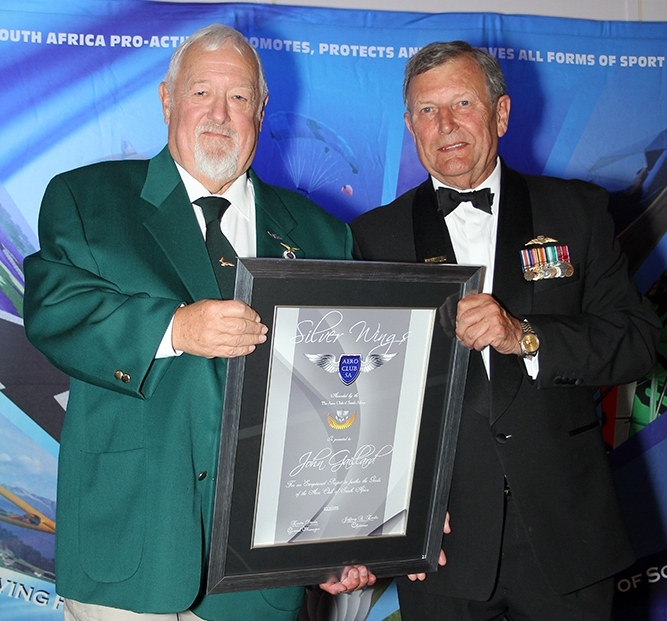 The very many hours of dedication, education and training to new display blood and organising of the Rand Airshow, makes Scully a worthy recipient of a lifelong award. Scully has been known through the years for bringing special acts and pizazz to the aerial party. Adding to the phenomenal contribution this aviation icon has made through the years, he brought pylon racing to our skies which due to safety issues was never permitted before. Scully in true gladiator spirit did not give up and this time he made it even more fun and laid out a course at the Parys airfield where pilots could experience not just brute force and flying skills, but tactical genius. The new format of racing the pylon circuit has proved to be safe and a winner in our sport and changing our world. Bob Allison has offered an excellent service to the Sport Aviation community availing himself as an ATC providing flight information services at our major EAA Fly-ins. Bob started as an ATC assistant at Heathrow, at age 23 he was transferred to air ministry seconded to the US Air Force. Bob joined the IAL stationed in Libya and was the watch supervisor on the night of Muamar Gaddafi's revolution. Bob did a stint in Zambia and commenced ATC duties at Jan Smuts in Jan 1972. In 1980 he went to Malaysia for 6 months to train personnel on the use of their radar. Bob returned to South Africa and went into business. Bob started doing AFIS for recreational aviation at the request of the Aero Club in 2001 and has since offered his help at many EAA fly-ins and other events over the years. Bob is an honorary member of EAA Chapter 322 Johannesburg. He is actively involved in safety seminars willingly providing guidance and assistance whereby he imparts his knowledge to our fellow aviators. ATC work at air shows has become a full time duty. To present safe aerial events, a dedicated and enthusiastic ATC was needed. Riaan has been that person to champion the cause of the ATC in the interest of public and participant safety. To facilitate differences in opinions and the application of rules, so as to make the show go on, Riaan has stuck out his neck on occasion, always willing to take issues very seriously in order to maintain an ATC presence, to facilitate the acquisition of expensive air show dedicated equipment to discuss and expand operational application of air safety rules. His personal presence and hard work at air shows always makes us proud to have such passion present when order is needed. 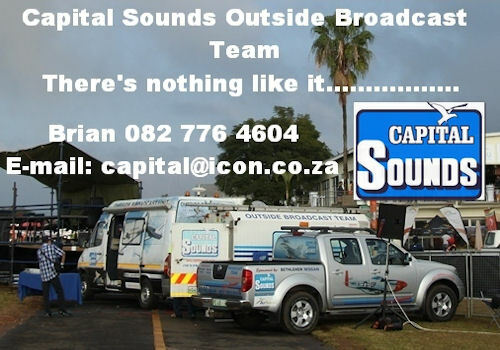 Riaan is honoured for his contribution, his clear passion and making the show go on. We thank ATNS for affording us the use of such an inspiration and clear fighter for the greater aviation good. Riaan, may this award be testimony to his character of strength, grit and passion. 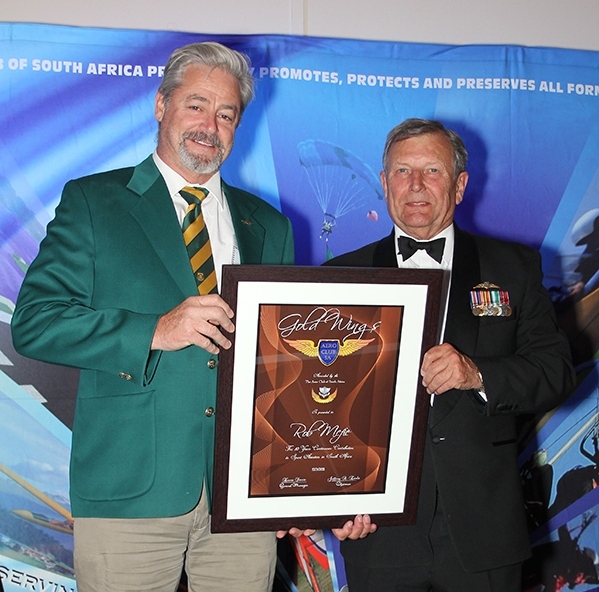 Silver wings were bestowed on John Gaillard for exceptional service in projects to further the Aero Club of South Africa. Until 1995, the only aerobatic category competed for at international championship level was that of the Unlimited Category, held every two years. 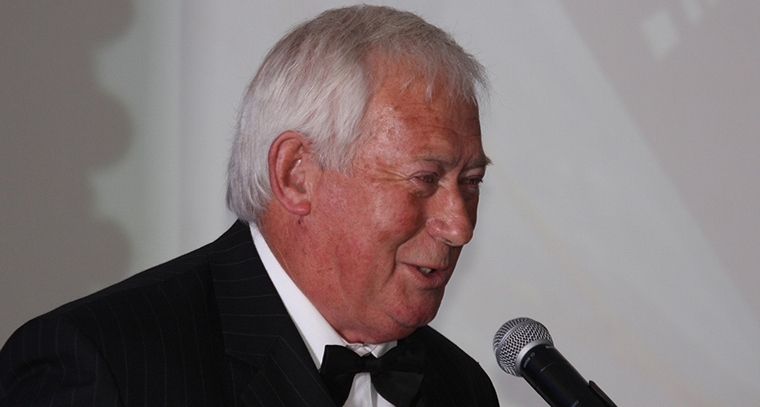 John Gaillard was the motivating force behind the introduction of a second championship category, the Advanced class, which South Africa hosted the first event in February 1995. This has since become the most popular championship class. John once again motivated for another international championship category in 2004, the Yak 52 category, and most recently the Intermediate category to be competed for alongside the Yak 52 event. 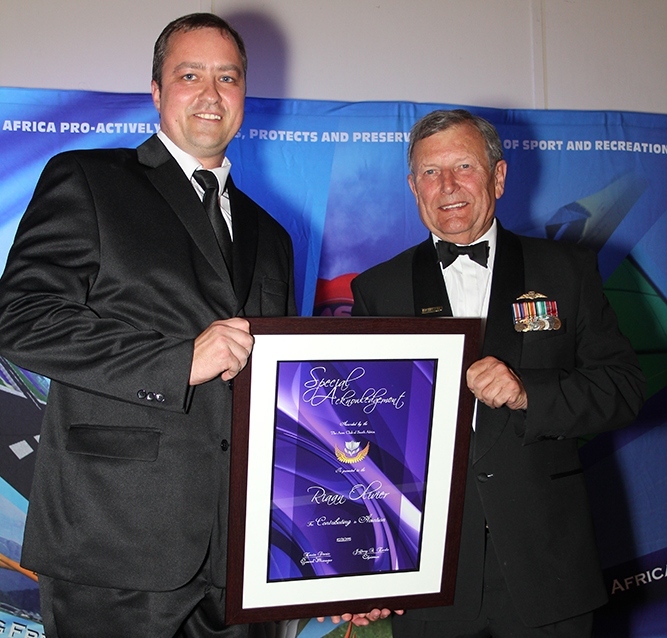 John Gaillard's vision culminated with the hosting the first Intermediate and Yak 52 World Aerobatic Championship in Mossel Bay during November 2014, at which he was also the contest director. 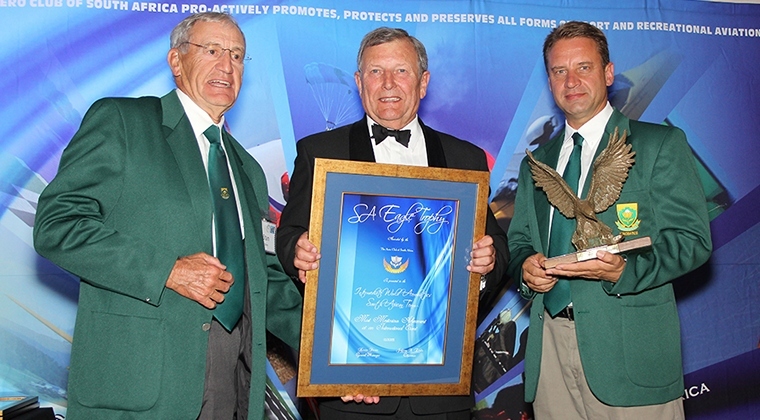 SA Eagle Trophy Meritorious Achievement at an International Event for was awarded to the Top 3 Pilots and the manager in the Team that competed in the 1st Intermediate World Aerobatic Championship. Michel Leusch, Neville Ferreira, Leigh le Gonidec and Team Manager Stan Oliver did exceptionally well taking the gold medal in both the individual and team events. Don Keth guest speaker for the evening, Gave a very informative talk on Situational Awareness and Systems and Crew Resource Management, he had the entire audience in stiches with his humoristic approach to this important subject. Don recently retired from aviation after an illustrious career which started in the South African Airforce ha later moved to Comair. 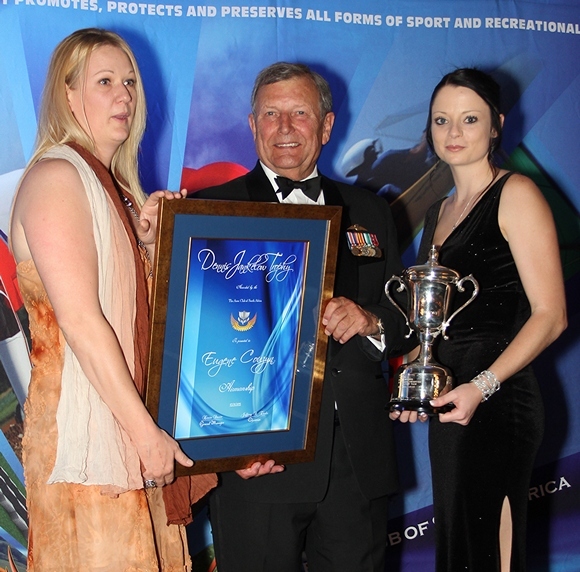 The prestigious Don Tilley Trophy Award for Safety in Aviation was awarded to the “Guardian Angel” of South African Aviators Santjie White. Santjie works continuously to promote safety. She has been an integral part of the industry SAFETY FIRST safety campaign; presenting where she can amidst the myriad of work she carries out for SASAR and ATNS. She also gives freely of her time to promote Search and Rescue and the safety message to small flying schools, flying clubs and similar. She also tries her level best to improve the focus of safety at the executive level of SASAR, and tirelessly promotes safety in her personal capacity on social media platforms. The standing ovation received by Santjie was a fitting testament to amount of respect and love the Aviation Industry has for this remarkable lady. 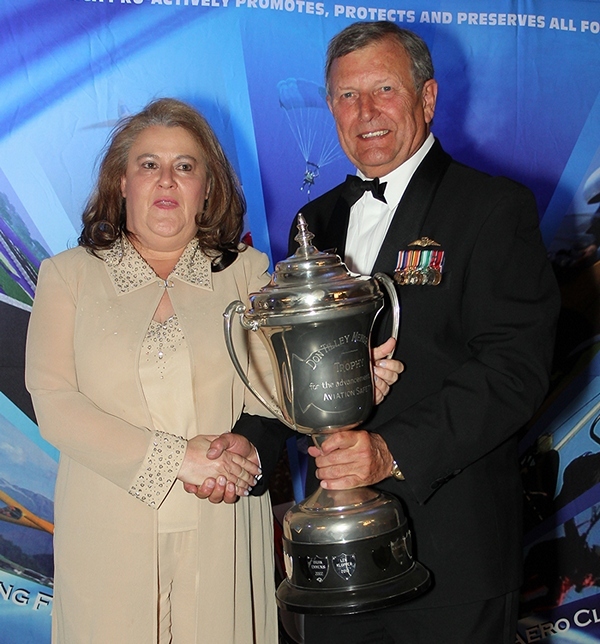 Eugene Couzyn was the recipient of the cavorted Dennis Jankelow Trophy for Airmanship. A product of Pretoria Boys High School, Eugene has been flying helicopters since 1994. These include no less than 10 types. He has devoted much of his flying to conservation work through The Bateleurs for the Endangered Wild Life Trust and other major conservation bodies. Last week he was given the EWT Cheetah Award, the highest accolade of the EWT Eugene flies on a Private Pilot's Licence and therefore bears the majority of the considerable cost of operating helicopters himself for noble causes. Most of the missions include wild life conservation of endangered species. This research and other aerial observation with scientist and ecological conservation officials assist in no small way in the essential preservation of our threatened ecology. In his EAA activities, Eugene has introduced very many members to the magic of helicopter flight and he is a tribute to The Aero Club of South Africa's membership. The African Pilot Airshow of the year award was this year awarded to The Lowveld Airshow, In a very close 2nd place was the Zandspruit Airshow followed by the Grand Rand Airshow taking 3rd , Judging this year's contest proved to be a difficult task as many of the shows around South Africa were in the running for the top spot. Botswana International Airshow and Namibia Airshow were awarded Special Recognition Certificates for the outstanding show presented by both of them. 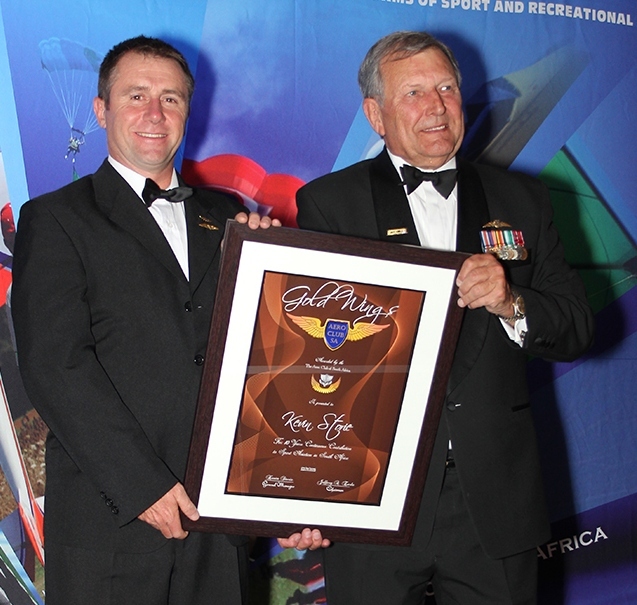 Golden wings were awarded to Aero Club Members that have given Ten Years Continuous Service to The Aero Club of South Africa, The first recipient was Rob McFie, Rob started flying and joined MISASA in 1982. His contribution to MISASA and the Aero Club has been in the field of events - initially as a participant and then later as the MISASA Events Officer and Africa Cup organizer. Rob has participated in most local competitions since 2004, in the Czech Nationals in 2006 and in Microlight World Championships in 2005 and 2007. As the MISASA Events Officer Rob organized the 2005 Dam Busters Derby and the year after revived the MISASA Africa Cup which he has organized every year since. 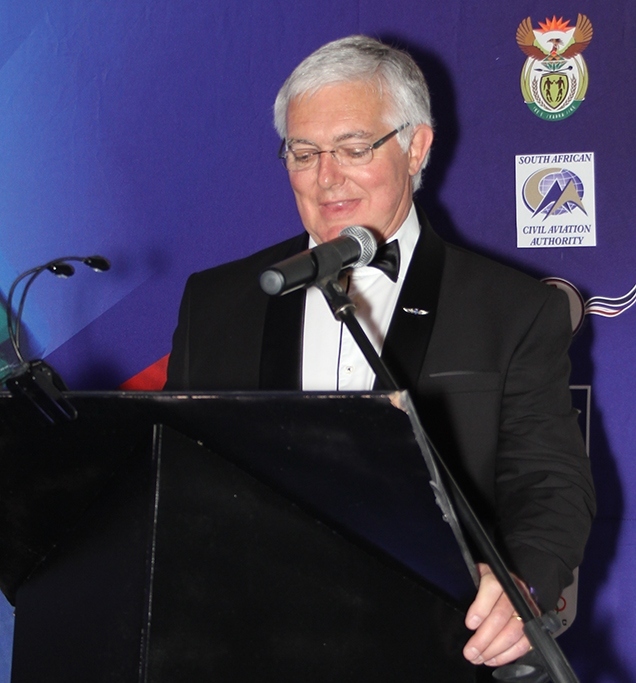 The Africa Cup is MISASA's oldest event which started in 1987 and with Rob's guidance and hard work. In 2006 there were 11 participants and this year there a record 32 participants. Certainly, the reputation of the Aero Club is enhanced by sub- sections establishing and sustaining events of the quality of the Africa Cup. 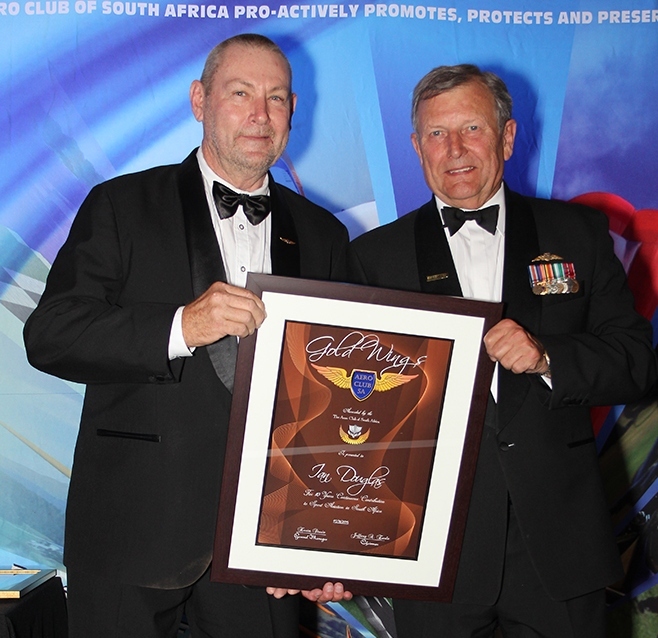 Ian Douglas was the next recipient, Ian 'Boss Doug' Douglas was nominated for Aero Club of South Africa Gold Wings in recognition of his more than 28 years of continuous service to skydiving in South Africa. His contributions to sport parachuting have served to maintain a high level of safety. As a PASA Master Parachute Technician Evaluator, he has set the standard amongst South African parachute manufacturers and parachute technicians. His service has included research and development on both civilian and military parachuting equipment not only within South Africa but also internationally. Ian has a genuine interest in and concern for all skydivers. He is known to go to great lengths to enable less fortunate skydivers to either loan his personal equipment or put affordable parachute equipment together for them. 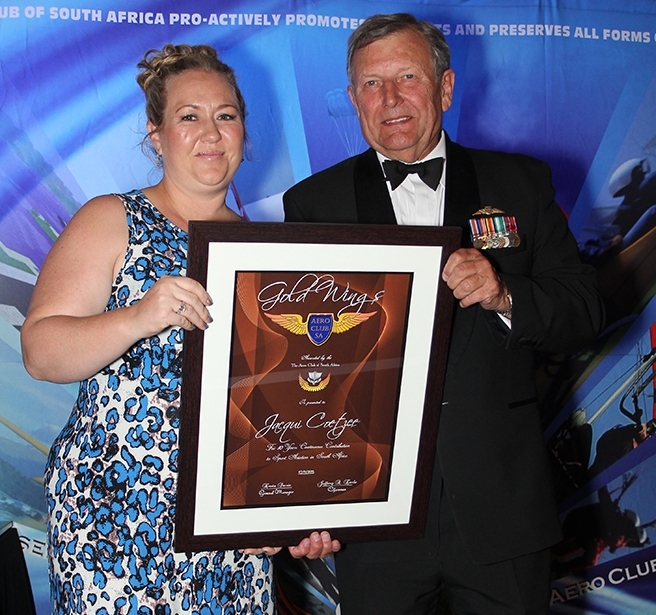 Jacqui Coetzee kept the ladies flag flying high becoming the third Gold Wing recipient for 2015, Jacqui is a second generation skydiver, she followed in her mother's footsteps by starting her skydiving career at the age of 15 in 1994 as one of the youngest persons to start skydiving. Her skydiving career was postponed for 8 years to complete her studies and rekindled in 2003. 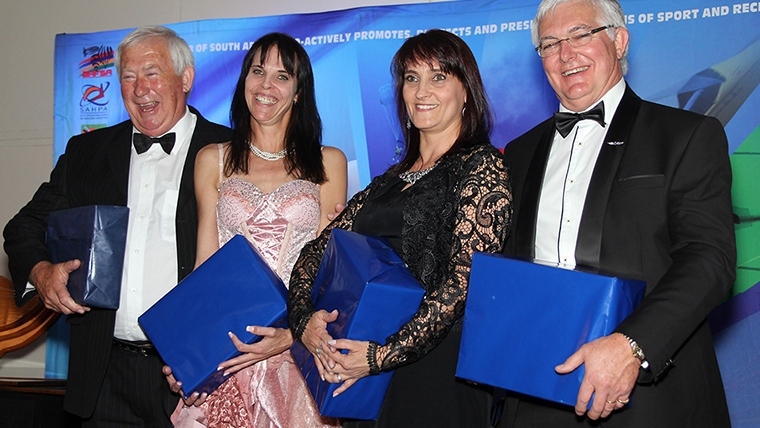 Jacqui Coetzee is a worthy and well deserving recipient of Aero Club Silver Wings due to her unselfish dedication to growing skydiving as a sport in South Africa as well as her proud exposure of South Africa's sport administration capabilities abroad, for the past ten years. She does not shy away from challenges and indeed tackles them head on as can be seen from the pioneering and developmental roles that she has fulfilled both internationally and in South Africa. And last but by no means least Kevin Storie. Kevin joined the Aero Club following his return from abroad in 2002 he engaged with leadership of Aero Club, since 2007 and was involved at the helm of SAHPA with the required integration of SAHPA into Part 62 NPL regulations as envisaged by SACAA and DOT. He was refreshingly direct in discussions and further more instrumental in shepherding the current commercial tandem system. His "let us get results and progress" approach resulted in him as the favoured candidate to take the reigns as GM of Aero Club of South Africa as we moved into a new with the founding of RAASA. 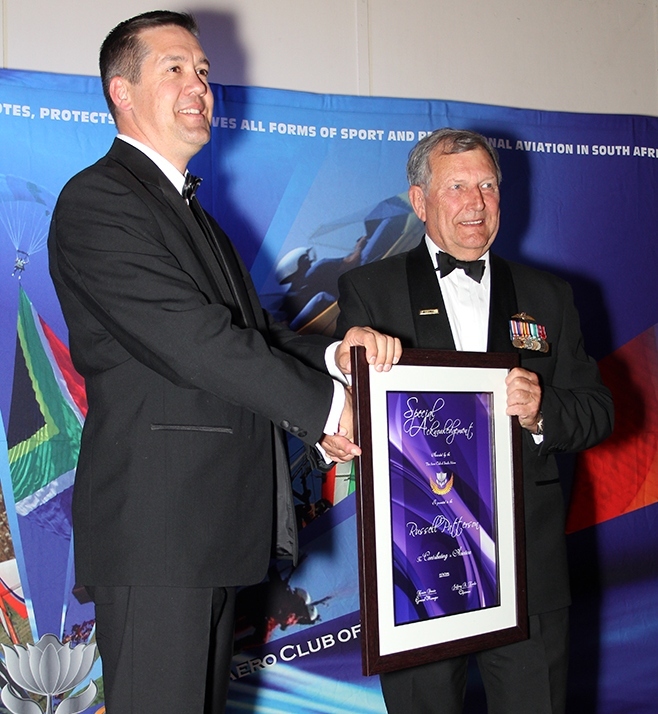 Stepping into the breach with his characteristic no nonsense enthusiasm, he has grown the reputation of Aero Club of South Africa and forged many vital relationships with industry counterparts such as CAASA, SAAF and of late RAFOC. His vigorous challenging of rules and regulations for the rights of the constituents of Aero Club at CARcom, NAScom, SAWS and ATNS to mention a few has furthered the preservation of free flight in South Africa. 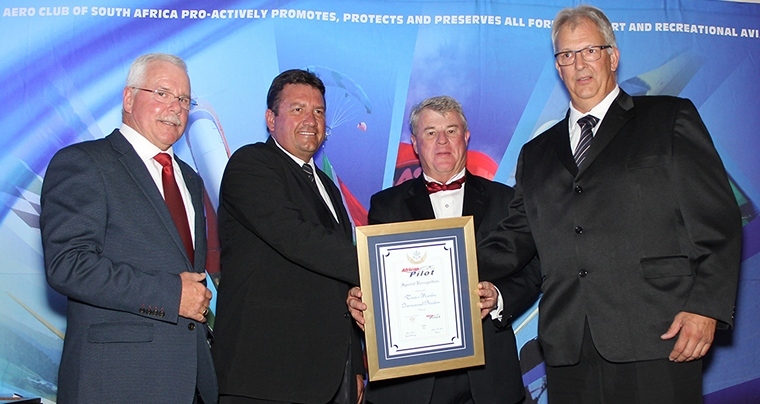 Establishing the Safety First Aviator brand and the development and roll out of the National Safety Campaign, already in its fourth year is amongst many examples and that is why Kev Storie is a worthy recipient of Gold Wings. Michel was unfortunately unable to attend due to prior commitments with the Chinese Red Bull Aerobatics Team. Having flown and competed successfully for many years, Michel eventually decided to take his skills to the next level. He competed in his first Sport Aerobatic Club contest in December 2010. It was clear from then on that he was going to do well. After winning numerous medals, he was selected to be part of the South African Intermediate Aerobatic Team to represent South Africa at the Intermediate Yak 52 World Championships. 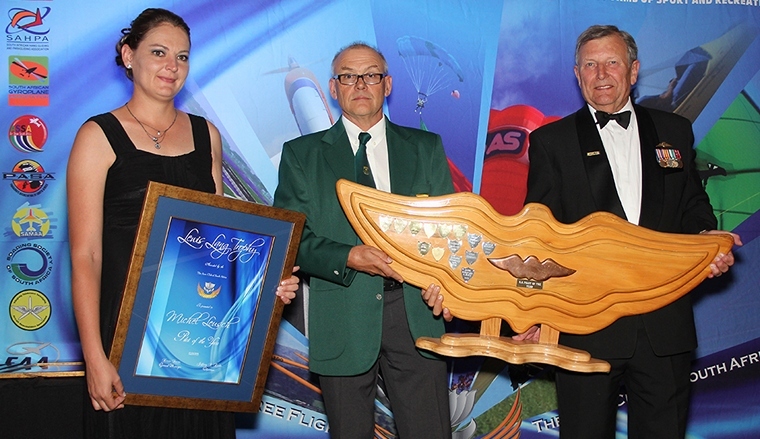 The contest took place in Mossel Bay in December 2014 and with very little time to practice in a borrowed aircraft. Michel managed to walk away with top honours, being crowned the Intermediate World Aerobatic Champion. A massive word of thanks to the SAAF Museum for making this historic venue available, a better setting for this occasion cannot be found.